I must say, the darling Miss Dior "Cherie" advertisements have been the highlight of my magazine flipping lately... A girl with beret on a bicycle with be-ribboned Dior boxes - because it's so charmant to shop the Avenue Montaigne on a bike. Or, the pastelled balloon bouquet lifting Maryna Linchuk high above Paris which puts the ending of Le Ballon Rouge in mind, but for chic, grown-up, fuschia-pink bubble dress-wearing big girls. Then, tonight I was in the middle of Gossip Girl... wait, what's that? Why is Brigitte Bardot singing one of her ye ye songs on the television? Chestnut trees, a vintage magazine, a girl with bangs, white cyclamen, and balloons...either it's my favorite era of French style or... Ohmigosh! 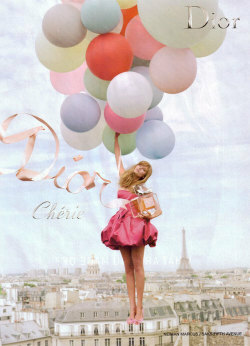 It's the Sophia Coppola ad for Miss Dior "Cherie"!!! I was so flustered with delight I didn't know what to think. But, my first notion was: "Damn, I should have gotten that DVR box forever ago! Please rewind!" The perfume was launched in 2005 - as a commemorative for Christian Dior's 100th bithday by John Galliano. A review of the perfume is available on the Now Smell This blog, which cites Galliano's inspirations as Stevie Wonder's "My Cerie Amour" and a vintage Dior gown from the archives called "Cherie". However, while the scent may be reminiscent of the classic 1947 "Miss Dior" perfume, it is entirely modern. So, a modern ad campaign with the modern, simple glamour of Ms. Coppola is entirely appropriate. Pink, pastel, soaring, and with a 1960s French girl-pop soundtrack - what's not to love? Also, as a film student, I love that this one little 30-second bit of film totally fits in with the greater body of Sophia Coppola's work. The look is very similar to the decadent pinkishness of Marie Antoinette, while the Diana-camera saturated cinematography is perfectly in tune with The Virgin Suicides. It shows a knowledge of Masculin Feminin and Un Homme et une Femme, with a little dose of Roman Coppola's CQ. The chain of aesthetic influence makes me giggle with delight! Overall, the whole campaign is pitch-perfect, full of ladylike optimism which is sorely needed right now. Unfortunately, there's no clip yet on YouTube, but visit Fashionologie (and its fabulous OnSugar capabilities) for a taste of delicious.